He’s been dead a while, 14 years or so. I never met him, but he gave me a life that extended four or 5 times beyond what it would have been. Because of him I lived to have children, to experience many joys and some sorrows. His beautiful eyes meet mine, across the years, in his military photo probably taken before I was born. He was a handsome guy, and he was married to beautiful darkhaired woman whose eyes seem to sparkle with wit. Her name was Olga. His, Vasilli Arhipov. He rose to the rank of vice admiral in the Soviet Navy. In 1961, when I was an awkward 14 year old, navigating life on an air force base in the middle of the Mohave Desert, he stopped a mutiny and prevented a nuclear accident that would have rivaled Chernobyl. But it was the next year that he really saved my life. October 1962. I was still on the desert, now barely 15. I was concerned about poetry, my white cat, and a guy named Jimmy. I was also fond of my tortoises, my Dutch rabbit named Happy, and, to a degree, of my annoying younger brothers. My parents didn’t talk much about the news. I was learning a little Spanish and practicing a speech (on nonconformity) for the Lion’s Club contest. But in those late October weeks something shifted. My classmates practiced running home at the sound of sirens. My mother, in the calmest possible way, told me that there might be…did she say war? Did she mention bombs? I don’t remember, only her description of how, perhaps, we would live underground for a while. We would share things. Food might be canned and boring, but I should eat and be thankful. We would try to stay together. I practiced the run from the school, over the cinderblock wall that bordered our yard. My mother said if we missed each other I should find the buses. They would be taking us to the borax mines. Officer’s families, like ours, would have preference. My best friend was a sergeant’s daughter. Could she come home with me? No, she would want to stay with her family, said my mother, when the sirens came. I never thought to ask about my cat or my rabbit. I wouldn’t have liked that answer either. Looking back I marvel at my mother’s calm during those weeks. I also marvel at my 15 year old mind, which didn’t seem to be picking up anything about the Cuban missile crisis but instead focused on whether or not a certain sandy haired guy really liked me. He was the son of the general, and so would be with us in the caves. I imagined the fun we could have. Paul, ten years older, tells me that during these weeks he worried a lot. Chain smoking in Los Angeles. Forgetting to eat. Sure the end of the world was at hand. But on October 27, 1962, the fine eyed Vassili Arhipov, in one moment, in one simple refusal, saved my life. And Paul’s. And yours as well. The already acclaimed naval hero was on board a submarine in Cuban waters. In the world people were waiting and watching a terrible game of brinkmanship and bravado as the US and Soviets seemed determined to tumble over into war. And Vasilli’s ship was buffeted by depth charges. The crew, his commanding officer, everyone..they thought this was it. And they readied their response—nuclear torpedoes. But there was a failsafe, much like that in our missile silos. The launch took three officers. Two were ready to go for it. Indeed, they may have been eager. He said they should wait to hear from Moscow. And he continued saying no, standing his ground, refusing to launch. And..the crisis passed. The world teetered at the brink of doom and was pulled back, by one simple act. By one man. And my life went on. Thanks, Vassili. It has been a good thing. And..I will always take hope in this, that one person, against the reasoned beliefs of all those around..could say no. Or sometime, in another circumstance, say yes. Or dance. Or question. Or celebrate. The point is…they matter, those moments. You matter, with your heart and your soul and your will. You never know when your small act may save the world. Take joy from that. I do. 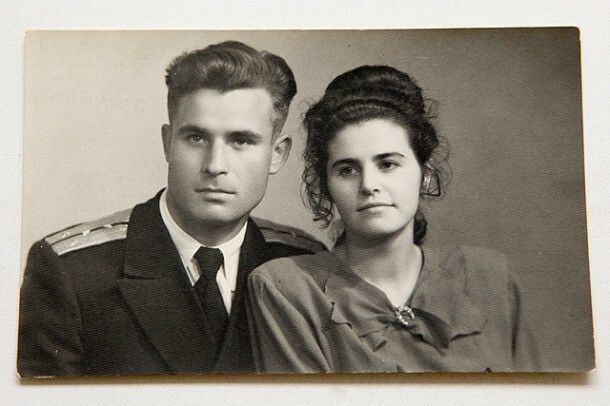 (the photo of Vassili and his wife Olga I found here: http://www.kpbs.org/news/2012/oct/19/secrets-dead-man-who-saved-world/) and I hope it is okay to use..